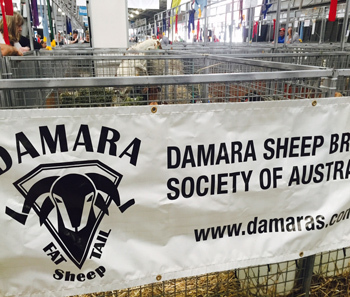 Damara Sheep Breeders Society of Australia Inc.
Once again this year Andrew and Sue Cairns embarked on the long preparation process of training, shedding, washing and preparing sheep to show. 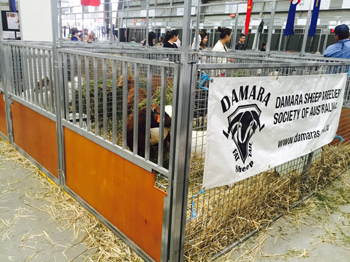 They travelled to Melbourne with seven Damaras including six ewes and one Ram. This year there was a lovely judge David Jackson. David was very nice and encouraging. It had thought maybe Rob Martin might judge the Damaras but he ended up judging the Poll Dorsets. If other breeders interstate are interested in showing sheep Sue said she would be willing to judge them so at least they had someone who knew the breed judging them. 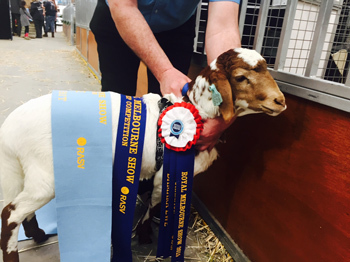 Their young ewe lamb who is just on eight weeks old was awarded supreme champion ewe and also supreme champion Damara. 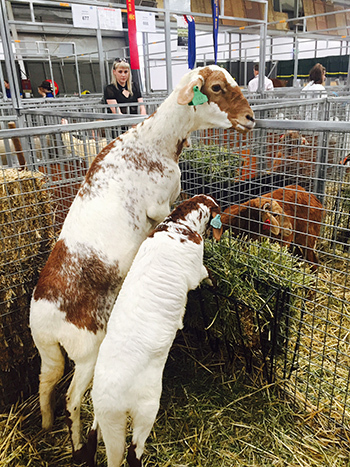 Her mother was reserve champion. David was most impressed with her and thought she was a cracker. He commented about how their breeding programme must be heading in the right direction having improved on this generation over the last one. The Cairns were very happy as this is what they are trying to achieve. 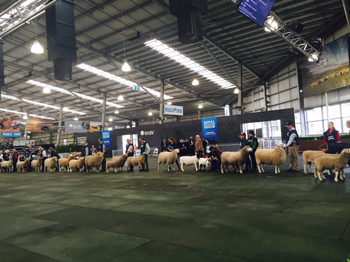 There was an enormous amount of interest and their position in the shed meant they were in the major walkway. The Damara pens were always crowded with passers by looking at them and asking questions. 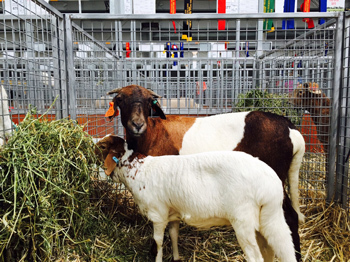 Sue did get tired of saying that they were sheep, not goats. Sue thinks they were the most photographed sheep in the show. Sue thinks that the website hits may increase as a number of Damara Society brochures were taken. 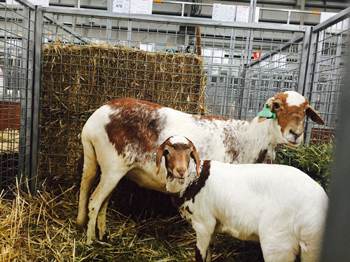 The Cairns decided to take the little ewe to the Interbreed, normally they don't bother but this time they thought they might create some interest with the public which they received and everyone was talking about her. They had no illusions that they might win. The judges were very nice and couldn't believe that she was only two months old. The sheep were exceptionally well behaved, one of the ewes walks on a lead like a dog. The society banner and Cairns reserve ewe in background. 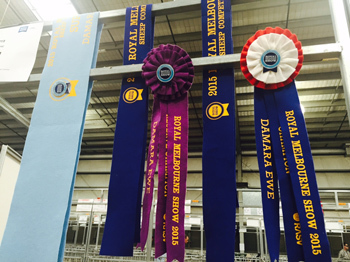 Like mother like daughter, champion and reserve ewes and champion Damara.